These numbers reflect estimated student expenses for the 2019-2020 school year. Amounts will change slightly from year to year, but as the cost of college increases, the scholarship packages will correspondingly increase. Your official financial aid award will be included in a letter directly from Colby. Outside scholarships will be used to decrease work study, as well as the student’s summer work contribution of $1,650. Students can still pursue work study as an option when they arrive on campus if they wish. All students must show proof of comparable health insurance to waive Colby’s health insurance. If students do not have comparable health insurance, they must sign up for Colby’s health insurance. Some students will qualify for a health insurance subsidy; this is determined on a case-by-case basis. Anticipated travel expenses are added to the student expense budget and considered when financial aid eligibility is determined. Students must remain in good academic standing. Students must also complete the FAFSA and CSS Profile, as well as all other required institutional financial aid application materials in order to maintain the match scholarship award. Colby's financial awards meet 100 percent of calculated need with grant aid and campus employment. Colby does not include loans in financial aid packages. As of June 1 2018, the average Colby College Grant for the first-year class was $51,285 and approximately 40% of the incoming class received financial aid. 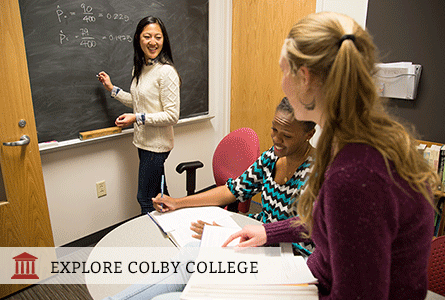 Use Colby's Quick Cost Estimator or Net Price Calculator to estimate the financial aid for which you are eligible.